Dang Yifei got 3 consecutive wins and finished second stage of Nongshim Cup. On 28th November, 19th Nongshim Cup World Strongest tournament finished its second stage in Korea. 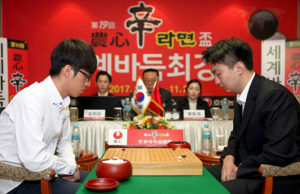 Dang Yifei stopped Shin Min Jun’s six consecutive wins and consecutively defeated Shin Min Jun, Ichiriki Ryo and Kim Myeonghun. Therefore all five games in the second stage finished. Now there is only Iyama Yuta in Japan team. Both China team and Korea team has two players. The third stage will be hold in Shanghai on 26th Feberary, 2018. Here are all five games records in second stages.